Is Pepsi Trying To Cash In On Black Lives Matter? Gee Pepsi, that one backfired. Pepsi's new "protest" ad, which had a miserable one-day shelf life until being pulled, has been widely criticized on mainstream and social media, as many feel the ad "trivializes protests for social justice causes." Although Pepsi claims they were trying to "project a global message of unity, peace and understanding," it certainly hasn't been received that way and is yet another painful reminder of why companies would be better off staying out of politics- because they're bad at it. Let me start off by saying, I think this is a stupid ad, and that I think Pepsi should have known this was a stupid ad as well. But I also don't find it nearly as offensive as some of the people on social media seem to think it is. To me it's a giant empty gesture, that was meant to appeal to progressive culture, and that missed its mark because it tried to sell to its audience without understanding it. Sure, you can argue that it presents a 2-D version of issues for the pure purpose of financial gain, and I'd agree with you- but you'd have to explain to me how that's different from virtually ALL advertising. You know, reducing our identities, desires, hopes, fears, etc. down to sound bytes and emotional appeals to sell products? That's not to say there aren't some legitimate criticisms of the way Pepsi pulled off this particular piece of infamous advertising. Two things stand out for me- namely that Pepsi's portrayal looks more like a street party than a protest, and that their unnecessary use of celebrity Kendall Jenner just makes the whole thing feel kind of cringy. It's further endorsement of the annoying idea that for some reason we should take celebrities seriously when they feel the need to insert themselves into politics. By all means, if you're passionate about a cause, and you know what you're talking about, feel free to speak out. But handing a cop a can of Pepsi in a hopelessly bland commercial spot doesn't qualify as a political message. It isn't activism. That goes for you too Pepsi- no one needed your generic message of support for beliefs, movements, and causes. 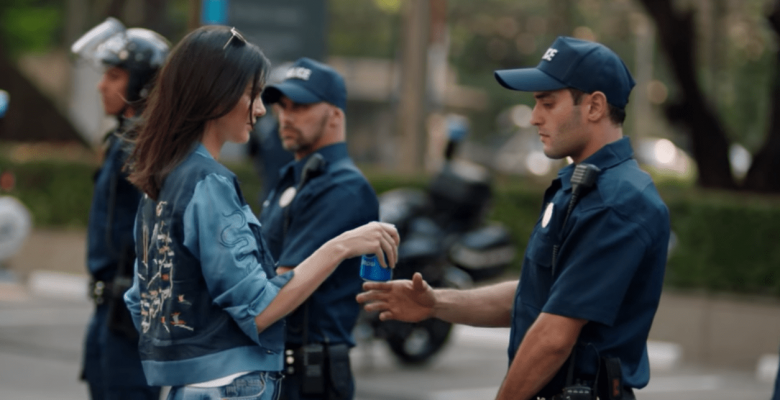 I say generic because what the people in this commercial are protesting about is entirely unclear- all we know is that the problem was apparently solved by a police officer drinking an oversweetened carbonated beverage. That hasn't stopped outraged members of the press and social media users from saying that the commercial must have been about racial tensions in America, specifically an attempt to capitalize on the Black Lives Matter movement. This is the part I don't get. Yes, race in America is a really hot topic right now, and Black Lives Matter is definitely one of the groups at the forefront of these issues, but I think it's far too much of an overreaction to say that this ad is specifically cashing in on Black Lives Matter. Black Lives Matter is neither the only political movement or group around that is engaging in protests right now, nor did they invent protesting. This claim seems to have started with the iconic image from the Baton-Rouge protests, where a woman defiantly stared down the police while being arrested. Okay, so strictly speaking the Tiananmen Square one is a standoff with the military, but the anti-Pepsi people used it (admittedly hilariously) so I thought I would include it aswell. My message to everyone here? Corporations, please don't try to convince us of your political convictions if you're not going to bother to take the time to think it through first, and critics, try to have a sense of proportion. There's clearly a difference between bad advertising and a plot to undermine and appropriate your movement. If you're going to be a critic, you should know the difference.